If you've been friends with me for any length of time, chances are I've given you a memory candle for some celebration or event in your life. 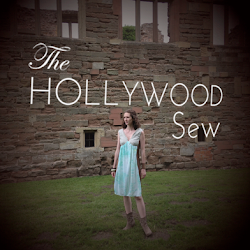 If you're lucky, I've even shown you how to make them yourself as it was shown to me. Well, now you no longer have to wonder how I pulled off this magic because today's post will teach you how to make them. First you should find a candle or candle container that you like. It should be clear, with smooth, straight edges (i.e. nothing that's small at the bottom and widens out to a larger top). Next, you need to find photos that you want to use and modify them. You should make them black and white, and you need to resize the photos to fit on the candle container. I turn them black and white and adjust the contrast in an online image editor like Pixlr or PicMonkey, and I re-size them in Word using the handy rulers next to the margins. 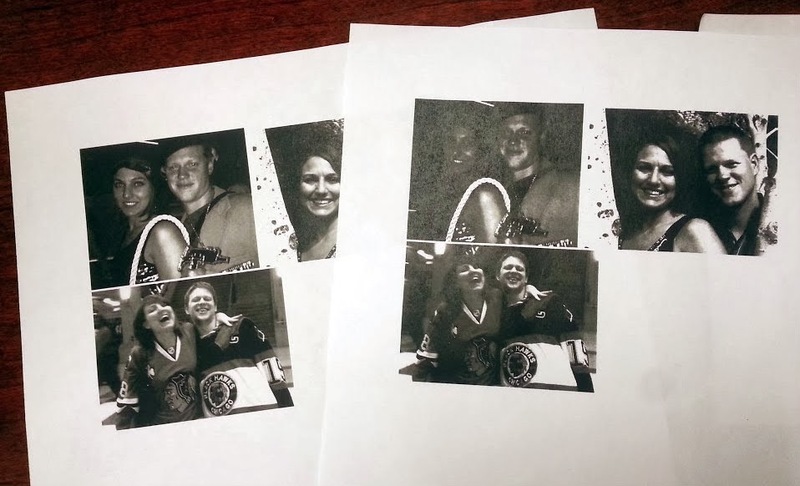 Once the photos are black and white and the right size, print them out. Make sure to give each photo a little white border which you'll need in a few moments. 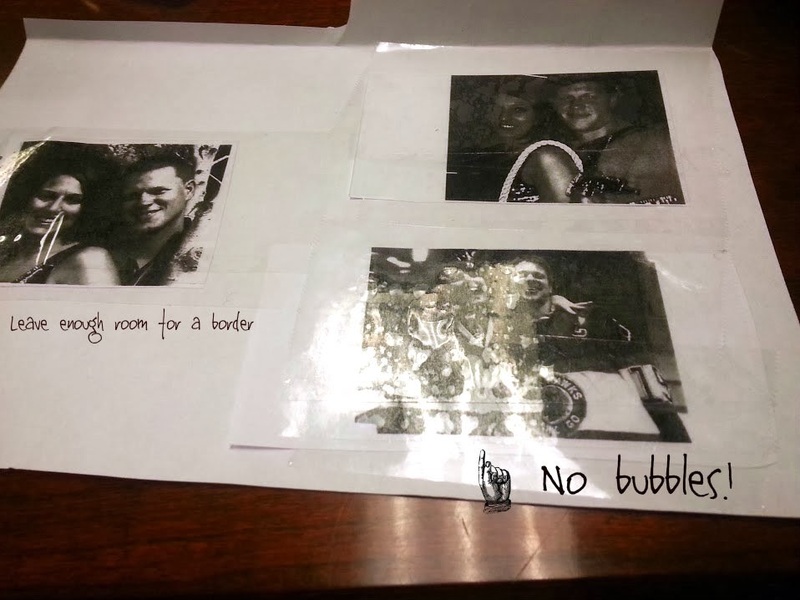 Once you've printed it out, make a photocopy of the pictures. Copier toner is cheaper and the picture looks worse, but that's the kind of ink we need for the project. If you have copier toner at home, perfect! If not, I make photocopies at work or the library and every so often at Staples. See the difference? We need less quality! Take packing tape and place it carefully over the picture. You'll want to create a border on each side of the picture. If you have a larger picture, overlapping tape is fine. Smooth out and press down the tape so that the ink can be picked up by the tape. Make sure there are no bubbles! 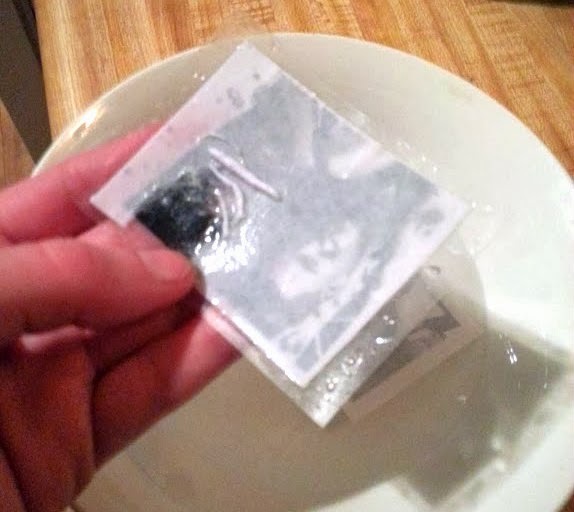 Fill a bowl with warm water and let your taped photos soak for 5-10 minutes. 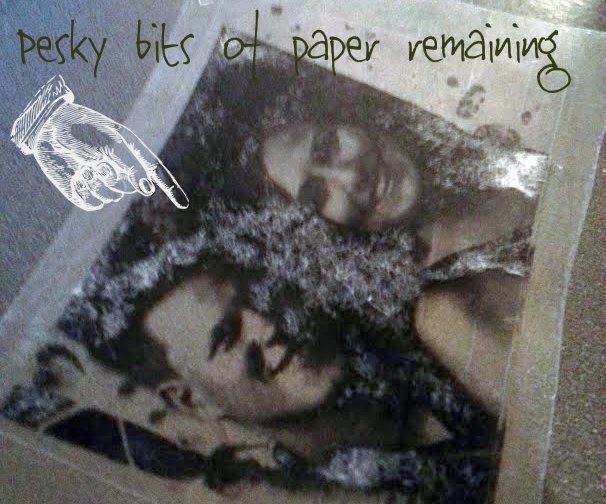 When you notice the paper separating, take the packing tape photo and gently rub to remove the rest of the paper. 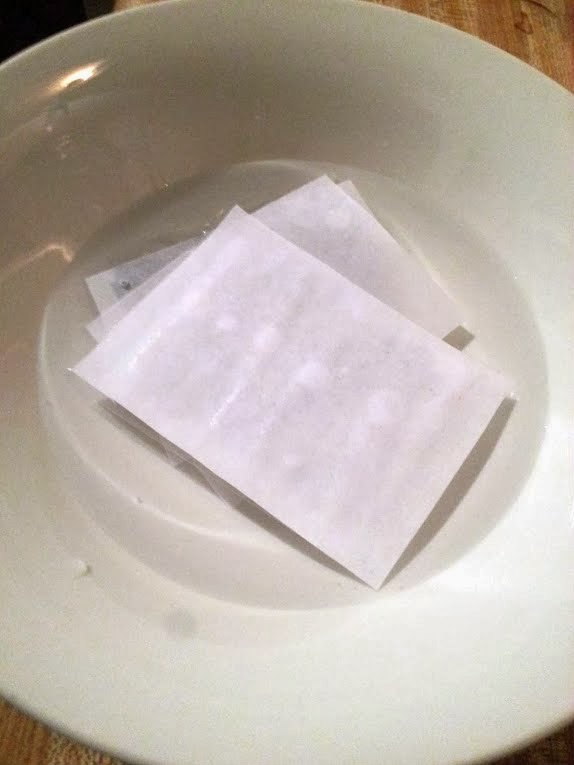 I find it's easier to remove the last bits of paper under running warm water. Shake the excess water off the packing tape and set it aside to dry. As it dries, you'll notice little bits of paper that you missed. You need to run it under warm water again and rub the last bits of paper off. Repeat a few more times if necessary until all the paper is gone. Once the tape completely dries and you don't discover any pesky bits of remaining paper, carefully line up and press the packing tape onto the side of your candle holder. Smooth it out so there are no bubbles. And there you go! You can add more pictures or just leave the one. Add a candle to your container and you have a wonderful, sentimental gift that can keep forever! Yay, I can't wait to see how it turns out! That is a really nice gift idea Kristin. I love mine! Can't wait to unpack my storage boxes and have all my trinkets around again. Great tutorial, really clear. I'm so glad you love yours - I should probably make you another one for Z I think... And thanks, I was worried it would make more sense in my head than when I was writing it down! Great idea and so personal! I love this idea! I love gifts with sentimental values, they're the best kind! Thanks for sharing with us! Grt idea!! does the tape still stick properly after being immersed in water n dryin up??? Yes, once the tape dries, it becomes sticky again!